U.S. Airstrikes In Somalia May Amount To War Crimes, Says Rights Group A new report by Amnesty International alleges that the U.S. killed at least 14 people in five different airstrikes in Somalia. The U.S. says it has never killed or injured a civilian. A Somali soldier stands near a destroyed building in Mogadishu, Somalia, on March 1 after police blamed a nearly day-long siege of the Somali capital on al-Shabab extremists. "Due to the nature of the attacks, the U.S. government is violating international humanitarian law and these violations may amount to war crimes," Hassan said. Hassan says that is part of the problem — that the United States is acting with impunity in Somalia. The U.S. acknowledges the airstrikes but won't conduct an on-the-ground investigation of who was killed, he says. "How will they know? They are just saying they have killed zero civilians but this credible evidence tells them they have to go now back to the drawing board and investigate these credible allegations of civilian casualties," he said. 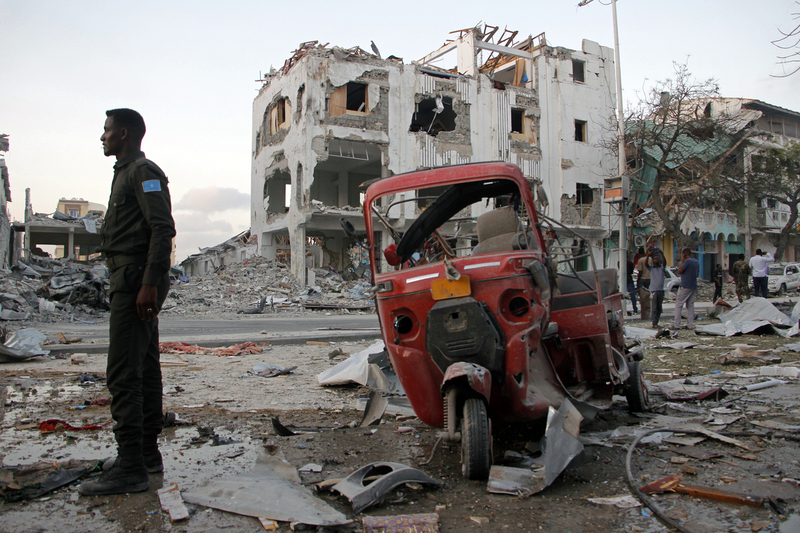 Amnesty is not the first to raise questions about American airstrikes in Somalia. Last Month, The Nation released an investigative piece that spoke to dozens of Somalis who had been displaced to refugee camps by the airstrikes. The investigation found that AFRICOM didn't make every airstrike public and that their claims of "zero civilian casualties is almost certainly incorrect." The United States, for example, has refused to make public basic details of its so-called "targeted killing" program, including when someone could be considered a terrorist or even the kind of aircraft being used. "Transparency around the use of lethal force is critical to allowing independent scrutiny of the lawfulness of operations and to providing accountability and redress for victims of violations of international law," the groups wrote. "Transparency also helps governments identify and address civilian harm. It enables the public to be informed about some of the most important policy choices the government makes in its name – ones that involve life and death decisions."